The sweet dangle. The saucer pass. The top-shelf snipe. 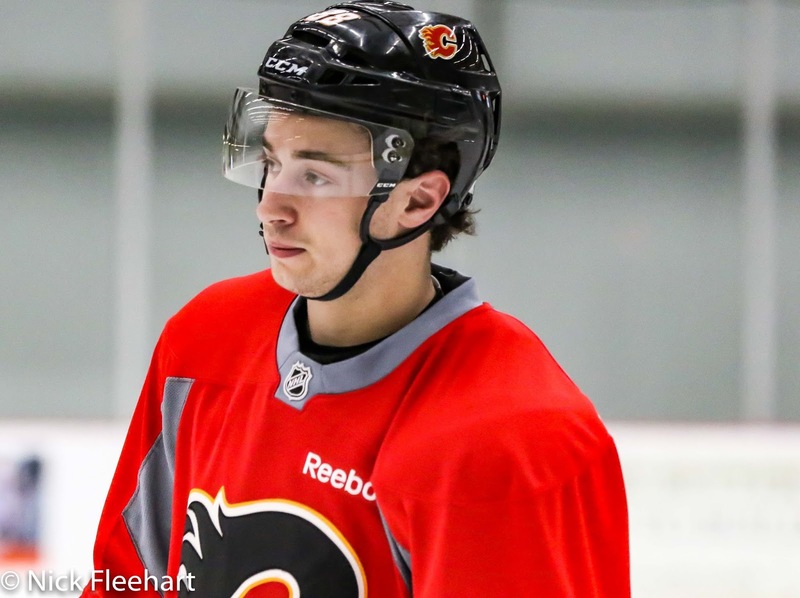 Soft mitts is what makes Andrew Mangiapane such an alluring Calgary Flames prospect. As a 20-year-old in his first year of pro hockey, Mangiapane racked up 20 goals and 41 points in 66 games with the AHL's Stockton Heat. Turns out, he's not too bad with the oven mitts also. "My specialty is chicken parm. My mom taught me that one," says Mangiapane with a smile. Mangiapane admits that one of the biggest changes in going from major junior to pro is being on your own when it comes to making meals. "A big change. In Barrie, you had your billets who were cooking for you, and my Mom was jsut 40 minutes away," Mangiapane says. Helping the players out in that capacity is Stockton strength and conditioning coach Alan Selby, who teaches them about what to eat and when grocery shopping, what to buy. They say that 80 percent of the equation is what you're putting into your body. If you're not carefully watching that, no amount of time in the gym can overcome that. Another step they take in the minors is enrolling the team's younger players in cooking classes at the nearby University of Pacific. So Mangiapane attended those sessions 3-4 times last year. 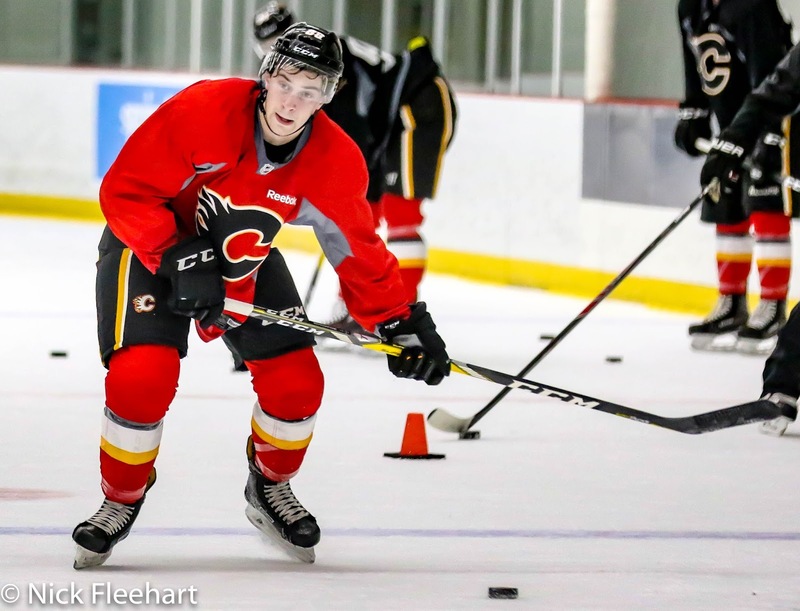 On Wednesday night, the 40 players attending this week's Flames development camp competed in a cooking contest held at the giant kitchen at the Saddledome. Sure enough, it was Mangiapane's team that was crowned champion. "It was really fun," admitted Mangiapane, the spokesman for his group. "We made Shrimp Cordon Bleu. We got goat cheese and ham and we stuffed it inside the chicken. It was (Mason) McDonald's idea so I can't take all the credit." Rasmus Andersson ... master chef? The young man of Italian heritage is on a roll this off-season. When he arrived back home after the season ended, he whipped up supper for his family. On that night, it was Swiss Chicken, a recipe he stole from Heat blueliner Kayle Doetzel, who frequently came over and cooked up that dish for the players. "They were pretty impressed, saying 'Who is this kid? So you can cook now?' I made some sweet potatoes as well to go with it. It was great." Mangiapane also served up some tantalizing statistics for his first year in the AHL. Of all the 1996 (or 1997) birth years, Mangiapane was 12th among rookies in points-per-game. That's pretty good. It bumps up to very good when you consider of the 11 names ahead of him, seven are first round picks, two more are second round picks and the other two are third round picks. Mangiapane was a sixth round pick. Talk about finding a piece of cheesecake at the back of the fridge. Mangiapane says nobody should care where you were drafted. "I think like that and I hope everyone else does too. After you sign and you start playing pro, I feel like that doesn't really matter any more, it's just about your game play," he says. "You can be a 6th rounder, a 7th rounder, if you're playing well and doing better than a 1st rounder, it doesn't matter where you get picked. It's how you perform and going out there and playing your hardest every time." Viewed by the organization as a top-six type of player, that's how Mangiapane was deployed by coach Ryan Huska. For a long time, his two linemates were veterans Matt Frattin and Linden Vey. "I was a bit nervous but each game, I got more confident out there," said Mangiapane. "Playing with Frattin and Vey really helped me at the beginning of the season. Both are veteran guys, who have had long pro careers. Playing with them just gave me more and more confidence." Mark Jankowski led the Heat in rookie scoring last year with 27 goals and 56 points but he was age 22. His selection in the first round of the NHL draft came three years earlier than Mangiapane. 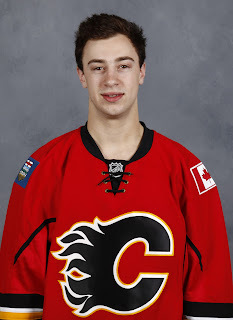 The last Flames prospect to notch 20-or-more goals in the AHL as a 20-year-old rookie was Markus Granlund in 2013-14. Granlund is now an NHL fixture coming off a 19-goal season (in 69 games) with the Canucks. Others to achieve that mark in their first year of pro hockey: Dustin Boyd in 2006-07, Matthew Lombardi in 2002-03 and Chuck Kobasew in 2002-03. 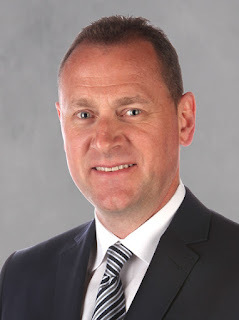 While their long-term impact varied, Kobasew and Lombardi both went on to play over 500 NHL games while Boyd appeared in over 200 before moving onto a long and successful career in the KHL. So history would suggest it's not a matter if, but only a matter of time before Mangiapane will get his first NHL regular season game. Last year, his Stockton roommate and longtime teammate Rasmus Andersson made his NHL debut. "Rassy was very excited and I know he loved being up there. Even though he only played one game, he was with the team for a while and he became good friends with everybody. It makes me want to get up to the NHL as well," said Mangiapane. "Hopefully this year I can get in a couple games in and try to make the team." There's certainly no shortage of skill when it comes to Mangiapane, which makes his ceiling in the NHL potentially as high as second line. The emphasis during the on-ice sessions at this week's development camp has been on skill development. Quick hands, quick feet, dynamic. It's opportunity for the native of Bolton, Ontario, to showcase all of that. Camp wraps up with a scrimmage today. His third and likely last development camp, he has enjoyed the experience. You've also seen him take some leadership responsibilities, which is another quality you like to see. "I'm one of the older guys here now, it's my third year. I'm rooming with Zach Fischer and it's his first year, he was just drafted," said 'old man' Mangiapane, who turned 21 in April. "I wouldn't say I'm taking care of guys, but you try to guide everybody and make sure they're on time and stuff like that. 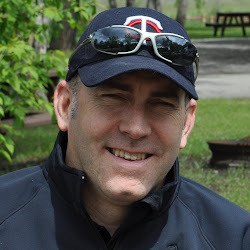 Ben Hawerchuk, who I played with in Barrie, is another younger guy in his first year here." Mangiapane says he's old enough to know to pick his spots. While he does have a bit of scrappiness to his game, that's nothing compared to his roommate. "He told me he had 14 fights last year," said Mangiapane with a chuckle. "I'm just keeping out of his way. He wants that side of that room, he gets that side!" Development camp wraps up Friday morning with a scrimmage at 9:30 am at WinSport. Wearing No. 88, keep an eye on Mangiapane as you never know what he'll cook up to impress the fans. Here is a young man who should be pushing the pile during the preseason. He is the ideal player for this team to build 4 effective lines down the road. Probably this year he will end up starting with the Heat but I could see him as a mid to late season call up. In some ways I could see him on a line with the two Mikes. Stick to hockey Haynesy, Italian cuisine is definitely not your thing. As an Italian I feel incumbent upon correcting this perverse and sacrilegious spelling attempt at an Italian delicacy. The correct and non-lazy North Americanized spelling is "Chicken Parmigiana"
Consider it fixed. The last thing I want to do is piss off the Enrico Ciccone's, Dino Ciccarelli's, Rick Tabaracci's and Luciano Borsatto's of the world. Next time, I'll stick to writing about Alex Smith and his adoration for peanut butter and jam sandwiches. Just safer that way. Thanks for the note. Ciao.